The Gold Medallion Car Certification Program honors the car owners who engage in saluting a period of time in motorsports history through the preparation of their cars. 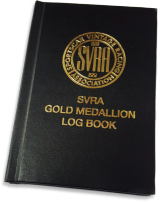 The cars of the SVRA Gold Medallion Car Certification Program are distinguished race cars that are prepared in a manner that accurately represents the time period that the cars were originally run or could have been run in. The Historic Gold Medallion cars have been verified as having in period race history and are period prepared. The Vintage Gold Medallion cars have been prepared to a specific point of time in racing history. The cars listed below are officially recognized as Gold Medallion cars, having met the car preparation standards.